We are excited to bring back one of our most popular shows ever in a special performance. Go back to the beginning in Plaza's most popular show ever produced as the Sanders Family Singers make their first visit to Mount Pleasant Baptist Church. Though Plaza has produced all 3 of the Smoke on the Mountain trilogy shows, many consider the first one the best. And we're thrilled to start at the beginning for the first time since 2008. They're back, and better than ever! City adds $1 service fee to each ticket. KEVIN POOLE (Burl Sanders) This is Kevin’s second time to play Burl in SMOKE..... (As a matter of fact, a goodly portion of this bio is stolen from the last playbill for SMOKE, as it is still applicable.) Kevin was last seen onstage as Thomas Jefferson in Granbury Theatre’s production of 1776. Prior to that, he was seen as Juror #4 in Granbury’s 12 ANGRY MEN and the Russian Intruder in Plaza’s SEE HOW THEY RUN. SMOKE....is dear to him because he grew up singing many of these songs around a piano with his own family. He can relate to the characters in this show because he has been an unsure and nervous “Dennis”, a lost and wayward “Stanley”, and is now busily occupying himself as a “Burl”, who is just trying to be a good man for his family. "I am reminded how precious my real family is and how utterly meaningless all this would be without them. To all our patrons, I hope you enjoy the warmth and humor in which this Gospel story is presented." CAMILLE SHAW (June Sanders) Camille is thrilled to be back with her Sanders family once again. She was last seen at Plaza Theatre Co. as Christine in DIRTY ROTTEN SCOUNDRELS. Some of Camille's favorite roles have been: Sylvia in SYLVIA, Maggie and Diana in LEND ME A TENOR, Ado Annie in OKLAHOMA, Florence in MAN WITH THE POINTED TOES and CURIOUS SAVAGE, Disciple in GODSPELL, Sabrina in SABRINA FAIR, and Marie Louise in MY THREE ANGELS. "A big thanks to my beloved, Adam, and sweet babies, Harper and Waverley, aka Narvelia Sanders!!!" ANDREW GUZMAN (Dennis Sanders) Andrew Guzman is honored to take his place in the Sanders family once again. You may have seen Andrew in past shows such as Carnegie's OVER THE RIVER AND THROUGH THE WOODS, ROMEO & JULIET...PTC's SMOKE...HOMECOMING, SMOKE...MOUNTAIN, FIDDLER, MAN...POINTED TOES, OVER...AND THROUGH THE WOODS. Favorite roles include Romeo in R&J, Dennis in SMOKE, Joseph in JOSEPH AND THE...DREAMCOAT at Artisan Center Theatre, Jose in MAN...POINTED TOES and the roles of Perchik and Motel in FIDDLER. Andrew would like to thank his family for all of their support and God for giving him the gifts that allow him to be here. KASI HOLLOWELL (Denise Sanders) is so excited to be back with the Plaza family for this encore production of SMOKE! Kasi was most recently seen on stage as Mrs. Gibbs in OUR TOWN at Sam Houston State University. Some of her favorite roles include Polly Baker in CRAZY FOR YOU, Potiphar’s Wife in JOSEPH AND THE…DREAMCOAT, Brenda in HAIRSPRAY, Ariel in FOOTLOOSE, and, of course, Denise in Plaza's previous production of SMOKE. Kasi is an avid reader, screalter, and user of the Oxford Comma. She is currently earning her BFA in Musical Theatre at Sam Houston State University. "Thanks to JaceSon for giving me the chance to do this show again and all my love to Mom and Dad." JACESON P. BARRUS (Director, Stanley Sanders) As a co-founding producer of PlazaCo JaceSon has been more onstage than not. This is JaceSon's sixth time performing Stanley Sanders with over 150 performances and is his fourth time directing one of the SMOKE ON THE MOUNTAIN shows. Other favorite productions he's had the pleasure to direct include AIDA, WILL ROGERS FOLLIES, THE SCARLET PIMPERNEL and ALL SHOOK UP. On stage he has enjoyed playing Harold Hill in THE MUSIC MAN, Henry Higgins in MY FAIR LADY, Father in RAGTIME and Captain von Trapp in THE SOUND OF MUSIC. He is forever grateful to be married to the splendid Tina Barrus and the proud father of sic extraordinary children - to them he sends much thanks and love. JONATHAN METTING (Rev. Oglethorpe) Previously seen at Plaza as Conrad in Bye Bye Birdie, Hunter in [title of show], Dickens/Fred in A CHRISTMAS CAROL, Younger Brother in RAGTIME, Robert Martin in THE DROWSY CHAPERONE, Bobby in CRAZY for YOU, Rev. Oglethorpe in SMOKE ON THE MOUNTAIN, Joseph in JOSEPH...DREAMCOAT, Cornelius in HELLO DOLLY, Tommy in ANNIE GET YOUR GUN, and Ozzy in THE SCARLET PIMPERNEL. Past favorite roles include: Huck in BIG RIVER, Freddy in MY FAIR LADY, Charlie in GOOD MAN...CHARLIE BROWN, Dickon in SECRET GARDEN, Barnaby in HELLO DOLLY, Barrett in TITANIC, Man 1 in SONGS FOR A NEW WORLD, Younger Brother in RAGTIME, Gary/Roger in NOISES OFF, Happy in DEATH OF A SALESMAN, Laurie in LITTLE WOMEN, John the Baptist/Judas in GODSPELL, Armand in THE SCARLET PIMPERNEL, and Bob Cratchit in A CHRISTMAS CAROL. "Special thanks to Mom, Dad, and little P for putting up with my crazy schedule." JAMIE DUGGER (Myrtle) Jamie is thrilled and grateful to be included in this beloved show with such wonderfully talented individuals. This is her third production with the Plaza Theatre. She was introduced to the Plaza audiences as Francis Gilbreath in CHEAPER BY THE DOZEN in 2010 then again last year in the Mission Band in GUYS AND DOLLS. Some of her favorite roles include Ellie Banks in FATHER OF THE BRIDE, Ms. McCutcheon and Professor Metz in THE MAN WHO CAME TO DINNER and Miss Carter in IT'S A WONDERFUL LIFE. She has also appeared in film and television and most recently you might have seen her sipping a smoothie in a popular television commercial. "A special thank you to JTAM for their faith in me and for the kindness, generosity, hard work and friendship shown to me and my family following the nasty little tornado of May 15th. They are truly the kind of people that make us CLEBURNE STRONG!! Also a special thanks to my beautiful family for your undying love and support!" CORLIS CORNILS (Maude) Corlis is reprising her performance in the Amen Corner where she last appeared two years ago. This is one of her favorite roles in her small, but special, theatrical career. Other performances include Aunt Tilly in Carnegie Player’s production of IT’S A WONDERFUL LIFE and Mrs. Dubose in Carnegie’s TO KILL A MOCKINGBIRD. She enjoys being on stage with her wonderfully talented husband, Jay, who taught her everything she knows - about the theater! Hopefully someday they can both be on stage together again. But for now, it’s "kick boody" (no shaking) time in the Amen Corner! PRISCILLA NIX (Maude) Priscilla (Wilkendorf) Nix is delighted to be in her 4th production at Plaza Theatre. She played a nun in both of Plaza's productions of “THE SOUND OF MUSIC”, playing the role of Sister Berthe in 2008. This is her 2nd time to be an "Amen Lady", once in SMOKE...HOMECOMING and now in SMOKE ON THE MOUNTAIN. She grew up in a musical family, singing and playing viola in a Baptist church, so she feels right at home in this show. She volunteers with her church and with hospice. She enjoys making crafts and spending time with friends and family. "I am grateful to God for my husband, Richard, step-son Jamie and daughter-in-law, Amber, as well as my six brothers and two sisters!" CHERI DEE MEGA (Cousin Melba, Musical Director, Pianist) It has been awhile, but Cheri Dee Mega is so glad to be back at Plaza Theatre Company and blessed to be doing another round of SMOKE ON THE MOUNTAIN. Cheri has been seen previously on the Plaza stage in all of the SMOKE productions and as the musical director for numerous other productions here at PlazaCo and also at Artisan Center Theater in Hurst. Cheri is the music teacher and choral director at Stone Gate Christian Academy in Irving, TX and also instructs private piano, voice, and guitar. Plaza provides an amazing place for families to be entertained and Cheri is so grateful for JaceSon, Tina, Aaron, and Milette for creating an environment where young artists can be mentored in every facet of theater. "Thank you for pouring into my son's life." Cheri and her husband, Brian have reared on son, Curt, who grew up under JTAM's tutelage. "Thank you to Jesus for His grace to live this blessed life." HOWARD GEISEL (Fiddlin' Forrest) Howard thanks the Lord and JTAM for letting him return as Forrest to laugh with his friends. Howard is a music teacher in the Arlington ISD. He gives all his love to his wife and best friend, Taffy. BOB GRACEY (Cousin Buford,Bass) is very happy and excited that Plaza Theatre asked him to play Smoke on the Water. I loved that song as a kid. We used to turn up the amplifiers to ELEVEN and...what? 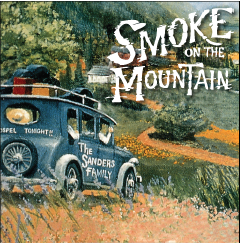 The show is SMOKE ON THE MOUNTAIN? Well then, scratch that. Regardless, he is very happy to have been asked to be in the band playing bass. Bob has been three other Plaza productions, all named SMOKE ON THE MOUNTAIN. He has also been in a few Carnegie shows, he plays cello and bass for the Brazos Chamber Orchestra and bass guitar for First Baptist Church in Cleburne. He also plays bass for the band Benay & Logan. In his free time, he as been the eye doc at Texas State Optical for the past 22 years or is riding a bike. He is married to the lovely and talented JoAnn Gracey. They have two grown children, Andrew and Chris, two cats and a dog. The dog actually fetches. The kids do not. PARKER BARRUS (Pickin' Parker) Parker has been in a few shows here at Plaza. You may remember him as Willard in last year's FOOTLOOSE, as Frank Gilbreth in CHEAPER BY THE DOZEN, as Raymond in KISS AND TELL, as The Washing Machine in CASH ON DELIVERY, Fredrich in SOUND OF MUSIC, Colin in THE SECRET GARDEN and as Benjamin on JOSEPH. Parker played Dennis Sanders in our 2011 production of SMOKE ON THE MOUNTAIN. He sends loves to Tabi, Cam, Edie, Mimi, and JJ. STEFANIE GLENN (Stage Manager) is delighted to be spending her summer at Plaza. Stefanie has stage managed lots of great shows with lots of great people and is a proud recipient of the 2009 Column Award for Best Stage Manager of a Musical-Non Equity. Stefanie holds a Master of Arts from Texas Woman’s University with an emphasis in Directing and Stage Management and a Bachelor of Arts from Harding University with an emphasis in Acting. "Hugs and kisses to Humphrey, Gigi, Mia, Belle, Lily, Fiona and Monica."